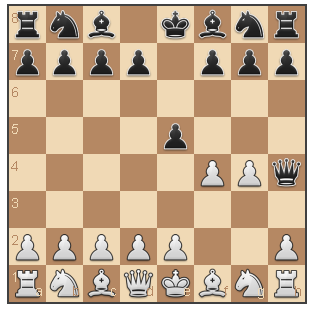 R package for chess validations, pieces movements and check detection. 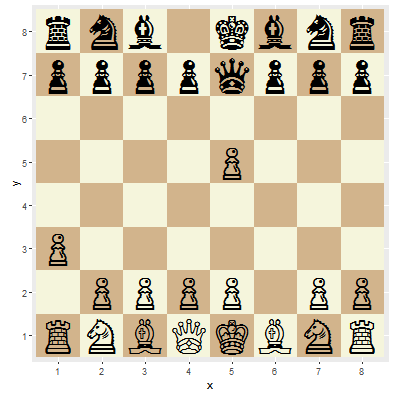 Also integrates functions to plot chess boards given a Forsyth Edwards and Portable Game notations. 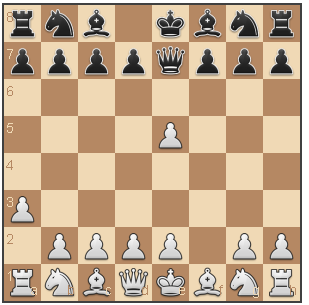 The rchess package is a chess move, generation/validation, piece placement/movement, and check/checkmate/stalemate detection. 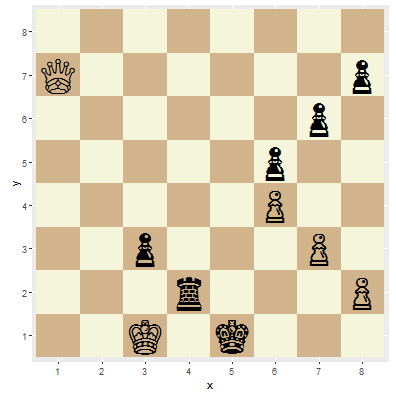 ##   "a3"  "a4"  "b3"  "b4"  "c3"  "c4"  "d3"  "d4"  "e3"  "e4"  "f3"
##  "f4"  "g3"  "g4"  "h3"  "h4"  "Na3" "Nc3" "Nf3" "Nh3"
##  "a3"   "e5"   "f4"   "Qe7"  "fxe5"
##  "a3"  "e5"  "f4"  "Qe7"
##  "rnb1kbnr/ppppqppp/8/4p3/5P2/P7/1PPPP1PP/RNBQKBNR w KQkq - 1 3"
fen <- "rnbqkbnr/pp1ppppp/8/2p5/4P3/8/PPPP1PPP/RNBQKBNR w KQkq c6 0 2"
##   "e4"    "d6"    "d4"    "Nf6"   "Nc3"   "g6"    "Be3"   "Bg7"
##   "Qd2"   "c6"    "f3"    "b5"    "Nge2"  "Nbd7"  "Bh6"   "Bxh6"
##  "Qxh6"  "Bb7"   "a3"    "e5"    "O-O-O" "Qe7"   "Kb1"   "a6"
##  "Nc1"   "O-O-O" "Nb3"   "exd4"  "Rxd4"  "c5"    "Rd1"   "Nb6"
##  "g3"    "Kb8"   "Na5"   "Ba8"   "Bh3"   "d5"    "Qf4+"  "Ka7"
##  "Rhe1"  "d4"    "Nd5"   "Nbxd5" "exd5"  "Qd6"   "Rxd4"  "cxd4"
##  "Re7+"  "Kb6"   "Qxd4+" "Kxa5"  "b4+"   "Ka4"   "Qc3"   "Qxd5"
##  "Ra7"   "Bb7"   "Rxb7"  "Qc4"   "Qxf6"  "Kxa3"  "Qxa6+" "Kxb4"
##  "c3+"   "Kxc3"  "Qa1+"  "Kd2"   "Qb2+"  "Kd1"   "Bf1"   "Rd2"
##  "Rd7"   "Rxd7"  "Bxc4"  "bxc4"  "Qxh8"  "Rd3"   "Qa8"   "c3"
##  "Qa4+"  "Ke1"   "f4"    "f5"    "Kc1"   "Rd2"   "Qa7"
##  "Nf3" "Nf6" "Ng1" "Ng8" "Nf3" "Nf6" "Ng1" "Ng8"
Not all from the package is the wrapper for chessjs. There are some interesting functions. This functions is a detailed version from the history(verbose = TRUE). 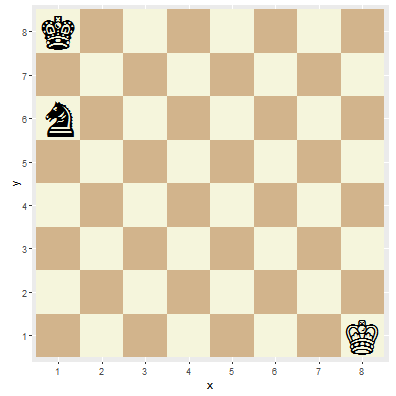 We can check the final board status with the (last) fen and the history_detail filtering by status == "game over"
This package is basically a wrapper of chessjs by jhlywa. Thanks to the creators and maintainers of these packages and libraries.